Choosing a dissertation or research topic can be a challenging time for many postgraduate students. In a collaborative project involving current students, alumni and staff, the Curriculum, Pedagogy and Assessment (CPA) department in the UCL Institute of Education, developed a way for students to access alumni for inspiration and advice. The programme leaders of three Masters programmes (MA in Mathematics, MA in Geography and MA in Science Education) developed a project after attending a Connected Curriculum innovation meeting: Cosette Crisan explains. “Enhancing the postgraduate students’ provision is a key objective of the UCL Education Strategy. Our project ‘Challenges and Opportunities in choosing a research topic and carrying out a dissertation project: Drawing on alumni’s experiences’ contributes to meeting this objective through addressing the 6th dimension of the UCL Connected Curriculum, by actively encouraging current students and alumni on three master programmes to work together. The postgraduate students (on all three programmes) enrolled on the year-long dissertation module spend the Autumn Term studying ten self-study online units aimed at supporting them to formulate relevant research questions and select appropriate research methods for their dissertation project. We asked these students for feedback, through a survey, on their experience and what kind of support they could have benefitted from when choosing their topics so we could improve this provision. The students indicated that, while they value the support of their current peers and the advice of the module tutor, they also wanted input from peers who had already studied this module and completed their dissertation (i.e., alumni). It was very important for us not to ‘push’ this on our students – we wanted our students to drive it and be involved in developing the solution so that it met their needs adequately. A student on each of the programmes, who was also a Student Academic Representative, co-led the project. They, in turn, encouraged all the students to get involved by holding focus groups with the current cohort to further explore what kind of insights they wanted to hear from the alumni to inform an interview protocol for the alumni. They then contacted recent alumni (who had graduated from the three programmes in the past four years) and selected 12 volunteers. Alumni were keen to get involved and help the students following in their footsteps. The interview questions (or scripts) were refined with the alumni and the programme leaders over email and then they were invited to the Institute of Education to record short videos for the students. Recording videos of the alumni’s experiences and answering questions set by the current cohort means that we created a bank of insight and experience that the current students can access at any time. Due to the input of the current students, what the alumni cover in their videos is also particularly relevant and useful for them. We also organised a live forum discussion with the volunteer alumni so that the students could, after watching their video, ask further, more specific questions. Each of the ten videos produced from this project have been viewed by almost the entire current cohort so we assume it was a much-needed resource. We’ll be interested to see what feedback is like from the next cohort who will benefit from these resources. We, as a department, have gained insights into the challenges our students have in conceptualising a coherent research proposal, choosing appropriate methodological approaches and how we can support them. Current and past postgraduates feel they are genuinely being listened to and that staff and students are actively engaged in making a difference to their experience. 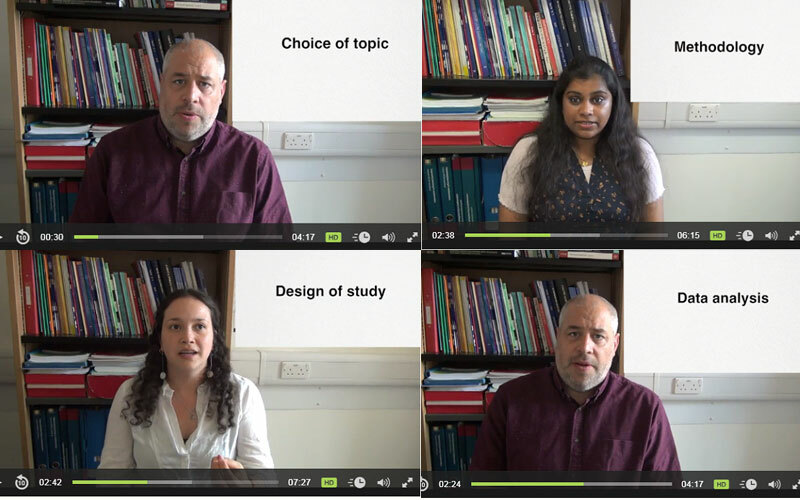 The database of short videos will support and enhance users (future PGT students) awareness of how their choice of research questions and methodological approaches will impact successful completion of their dissertation/report. One international Masters student commented: "These videos help me in several ways. But the most important thing is that they could enlighten my thinking through combining with working experience.....In addition, these videos and dissertation samples give me a good model to think the suitable research methods that I probably could apply in my dissertation." Media colleagues edited the videos and in Autumn 2018, the videos were uploaded to a Moodle area. I believe that any department or programme could benefit from this approach. It’s a great way to capture the experiences and insights from our incredible alumni and benefit current and future cohorts. Due to the global and dynamic nature of our student body, it’s also a good way to get access to alumni who are often spread around the globe, or are too busy to give much of their time to help support and inspire current students. Seek help from Media services with video recording and editing.